I’m from Colorado. We’re obviously pretty land-locked here, so the Ocean has always seemed exotic and foreign. I’d visited them in short bursts in New England (serene but freezing and always from a distance) and looked with unease upon the dirty beaches of California (too crowded and too much trash). We would lug our stuff down steep stairs onto the beach, where we stayed for maybe two hours, playing in the sand, getting sunburned, and then starting the long trek back to the car to make that exhausting drive back to the hotel. On the whole, it seemed like a lot of work for two hours of pleasure. My conclusion was that the ocean was beautiful, yes, but the process of getting there was both exhausting and complex. There was sand… everywhere, the parking was a nightmare, and swimming was barely possible. The ocean didn’t seem worth the energy. That all changed when I spent a week on Singer Island in Florida. We arrived in Florida, fresh from a chill Colorado September, and were greeted by sunshine and a subtle hint of humidity. We soon arrived at our hotel, the luxurious Palm Beach Shores Resort. The hotel is a bright flamingo pink, a delicious pasty on a strip filled with bland-colored hotels. Singer Island, a 47 mile white sand stretch in Palm Beach County, is home to thousands of condos, the very model of wealthy living in Florida. A warm Caribbean lobby greeted us, and we quickly found our way to our adorable little bungalow room. When I pushed open the sliding glass door (and after I screamed at seeing a small black snake outside our room), the scent of the ocean hit me: blissful wave of salty clean air. It was close. Holy cow, it was really close. We quickly pulled on our swimsuits and then grudgingly packed a bag. Towels, books, flip flops, snacks, water, cameras, pj pants, tops, a blanket…you would have thought we were packing for a two month stay on The Beach with Leonardo Dicaprio. (I guess that wouldn’t have been so bad…) We put our bags on our shoulders and headed out to brave the ocean. We walked past the tropical pool shaded by palm trees and surrounded by young parents sipping daiquiris, across a short boardwalk that came directly out from the hotel and then…. Huh. There were no stairs down to the ocean, no parking lot, no trek across barren land or wide rows of sunbathers. I couldn’t believe it – there was the ocean, not 500 feet from our hotel room! Our toes wiggled in the sand. Our hotel owned the portion of beach in front of it, so we were one of only maybe 6 people there. It was quiet and lovely, with the wide impassive ocean roaring in front of us. With glee, we kicked off our shoes and ran for the ocean – three pasty white, Colorado girls. My friends swam out quickly and were soon bouncing happily up and down in the unbelievably warm water. My experience with the ocean was not exactly like that. As I waded in, the strong waves kept pushing me backwards. The waves that had looked so small from the beach were suddenly akin to the terrifying tunnels of Blue Crush. I tripped over the ever changing sand beneath my feet and fell back hard. The salt water got in my eyes, temporarily blinding me while I flailed about. It was hard to stand. I tried to go in again and the waves pushed back, making me somersault over backwards. This time I was swept underneath them and tossed feet over head against the rough pebble bottom. My knees and hands were scraped and bloody. I felt like I’d been through a washing machine. My swimsuit was half-hanging off, much to the despair of the families on the beach. My wet hair was plastered to one side of my head, and I was close to bawling. In about two minutes, the ocean had turned me from an ocean worshiping sun-lover to a bitter, embarrassed land-dweller. My friends gestured for me to come further, but I just couldn’t do it. The memory of that moment, when the waves dragged me under, was too powerful. I stomped my way back to the room and took a shower . About a gallon’s worth of sand fell out of my swimsuit bottom. Great. I meandered around the room for awhile, but eventually I was bored. I wandered back out to the beach to see what my friends were doing and was amazed again at the ease at which I arrived there. By now the sun was setting, and so my friends and I laid out our blankets and watched the sun sink below the clear blue. It turns out that I like the ocean when I’m not fighting my way into the waves. All through the week, I slowly made my peace with the ocean that had so violently spit me out on shore. I loved the way it sounded, the way I could hear it’s lulling crash from my bedroom, and the way it fell dangerously silent when a storm approached. I loved the way my skin smelled of salt at the end of the day. And on my last day on Singer Island, with my sister holding my hand, I finally made my way out past the waves and swam. 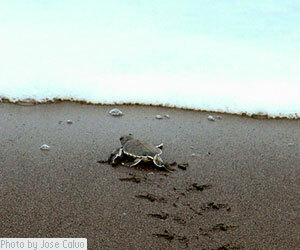 As I bobbed happily in the ocean (trying not to think of sharks), I saw a baby sea turtle swim past me. I caught it in my hand for just a moment, looked into it’s eyes, and set it back on it’s way out to sea. I was simply enchanted. Me and Ocean, we were one at last. I finally understood that the ocean was neither a picturesque fantasy nor something violent and terrifying. It was just unpredictable, not unlike myself and my fluctuating moods. With this in mind, I drifted content under the bright Florida sun. I’ve come to know that when I travel, IF the primary attraction of my travel is the ocean, that the accessibility of the ocean is the most important component of the trip. Getting there must be effortless, for a vacation spent lugging around bags, parking and navigating crowded beaches is not a vacation. It’s a sandy and exhausting chore. So, if you love the ocean (or even if you need to learn to love the ocean), then Singer Island – particularly the Palm Beach Shores Hotel – is the place for you. Watch for the turtle. I named him Ryan. My favourite part is the Sanibel Island area. We’ll be spending 3 days there (on the beach in Fort Meyers) next week. Heading to Orlando on Friday for a week and then south. FLA is a terrific refuge for those of us who come from cooler climates. I totally love being in the ocean. But you’re right! You have to be careful of the current! Thanks for the comment Doreen! 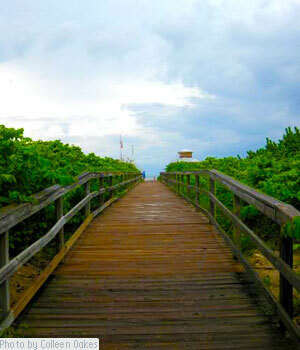 I hope you have tons of fun in Sanibel, one of my favorite Florida islands!